LAKEVIEW — After stints at iO, The Second City and Upright Citizens Brigade, Kevin Mullaney and Angie McMahon know a thing or two about comedy. So it makes sense they've devoted their new Wrigleyville theater to the topic. 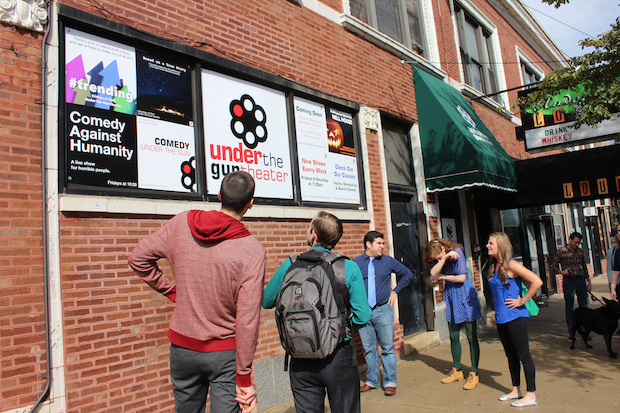 "We want to create a comedy theater — not just an improv theater," Mullaney said about Under the Gun Theater, which opens this Thursday at 956 W. Newport Ave.
"Sure, we are going to have improv. That's a great chunk of our programming. But we're also going to do sketch and plays and musicals, storytelling, whatever we can think of. The common thread is comedy." The second-floor theater, which seats about 90 people, will host regular shows Thursdays to Saturdays — plus classes and workshops throughout the week. Mullaney, who serves as the theater's artistic director, has taught improv for nearly two decades at iO Theater and Upright Citizens Brigade. He'll teach advanced and drop-in improv sessions. Meanwhile, executive director McMahon, who teaches writing at The Second City, will host entrepreneurial workshops that focus on budgeting, producing and funding a show. "This is my third time opening a theater in Chicago," McMahon said, "but it's the first time it's a 50/50 partnership with someone, and not a nonprofit or me working for somebody else. That's awesome." McMahon and Mullaney launched Under the Gun Theater Company last year. Since then, they've rented office space in Wrigleyville and performance space at the Apollo Theater, 2540 N. Lincoln Ave. There wasn't necessarily a plan to expand, McMahon said. But when a small theater opened up in their Wrigleyville office building this June, the pair pounced. They spent the past few months working with a design team to build a new stage. When guests walk in to the theater, there'll be a bar to their left, several rows of seating to their right, and tables and chairs just in front of the stage. "It's blind faith that we're jumping into this super fast. It could be stupid to open another comedy theater," McMahon said, pointing to successful Chicago institutions like iO Theater, Annoyance Theatre and The Second City. "This could be the stupidest time in the world to add to all of that, or the smartest time. I have no idea. But it feels right." Under the Gun Theater still doesn't have its business, liquor or performing arts venue licenses, McMahon said. For now, the theater will operate on a "suggested donation" basis until the licenses come through. Paperwork has been filed. Upcoming shows include "Comedy Against Humanity" and "The Zombie Diaries." Michael Delaney will teach a one-day scene study workshop for long-form improv this Saturday.